Stunning custom home on large golf course lot in gated Isleworth. 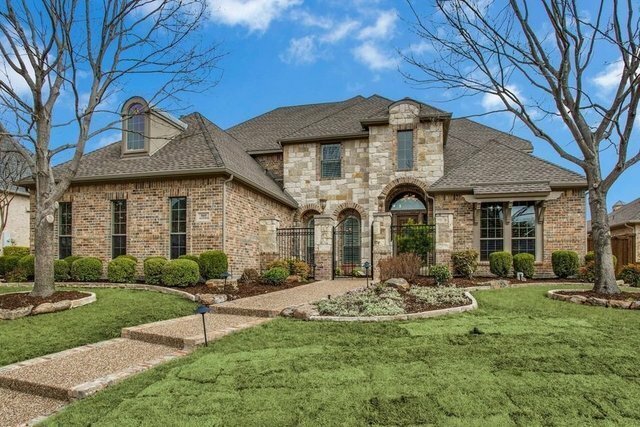 Just a moment's walk to the Stonebriar Country Club for a round of golf!Incredible backyard oasis with resort style pool and spa plus arbor for outdoor living and plenty of extra grassy area too! Fantastic finish out on this custom home with a great floor plan. Dramatic entry with views of the golf course and showcases the formal dining room, formal living room with fireplace, and study with French doors, built-in desk and bookcases.Very open kitchen and family room with views of the golf course. Kitchen has a raised breakfast bar with plenty of bar seating, island, granite counter tops, five-burner gas cooktop, built-in refrigerator/freezer, stainless steel appliances, double ovens, microwave, large walk-in pantry, plus butler's pantry with glass cabinets and granite. Just off the breakfast room is a large sunroom with tons of windows, making it a perfect sitting area to enjoy the views of the golf course and the large yard.Oversized family room with fireplace, built-in entertainment area, and walls of windows for stunning views of the golf course and amazing backyard retreat. Downstairs guest suite has plenty of privacy and a private bathroom. Master suite has a bay window that overlooks both the golf course and the outdoor oasis. A private door leads to the downstairs patio. Master bathroom has his and her vanities, a jetted tub, plus a walk-in closet.Amazing upstairs with huge game room and media room, plus three bedrooms and two full bathrooms. The large upstairs balcony just off the game room boasts gorgeous views of the golf course and Stonebridge Ranch.This wonderful home is loaded with many other features such as hardwood flooring, shutters, sprinkler and security systems, two pantries, two staircases, wet bar in the media room, walk-in closets in all the bedrooms, lots of storage throughout, a three-car garage, and side driveway!